In honor of Veteran’s Day, our What’s So Funny segment takes a look at humor derived from our military history. As a people, we Americans don’t like hierarchy—some people on top and some on the bottom. This is why we separated from England and don’t have kings and queens. However, hierarchy—based on wealth and status—still exists. In order to minimize these differences, part of our cultural history involves making fun of the rich, the powerful, and the non-working class. One place where this is difficult to do is in the military, where strict hierarchy is everywhere. 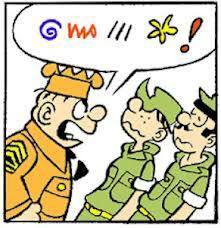 This is perhaps why cartoonist Mort Walker chose to make fun of military officers, starting back in 1950. Walker’s long-running cartoon is called Beetle Bailey. If you think you know why today’s cartoon is funny to Americans, share that with our readers in the comment section. The enlisted soldiers have told Lt. Fuzz that the camp’s general would be giving him a promotion. He excitedly shares this “news” with Gen. Halftrack’s secretary, Miss Buxley. She tells him that the soldier’s are pulling his leg. To “pull his leg” means to kid him, to tell him something that is not really true. This cartoon is funny to Americans who like to poke fun at people who are higher than they are in the hierarchy. Lt. Fuzz has been tricked by the enlisted men (lower than his position), and that fact has been reinforced by a secretary (who has no direct status in the military hierarchy). The rank of U.S. military officers (in descending order) is as follows. The rank of enlisted military personnel (which is below the officers) is as follows. Here, Sgt. Snorkel (nickname: Sarge) yells at Pvt. Bailey and a fellow soldier. The colorful symbols in the speech bubble signify strong language.